Every so often, an Apple I comes up for auction. The number still in circulation is small. Even rarer are working Apple Is. Next month, auction house RR Auction will sell a working Apple I that’s been rated 8.5/10. The computer, along with peripherals and the original manual, is expected to fetch around $500,000. Earlier this summer, I had the good fortune of seeing a working Apple I in person during a trip The Henry Ford Museum with Stephen Hackett who donated his collection of iMac G3s to the museum. 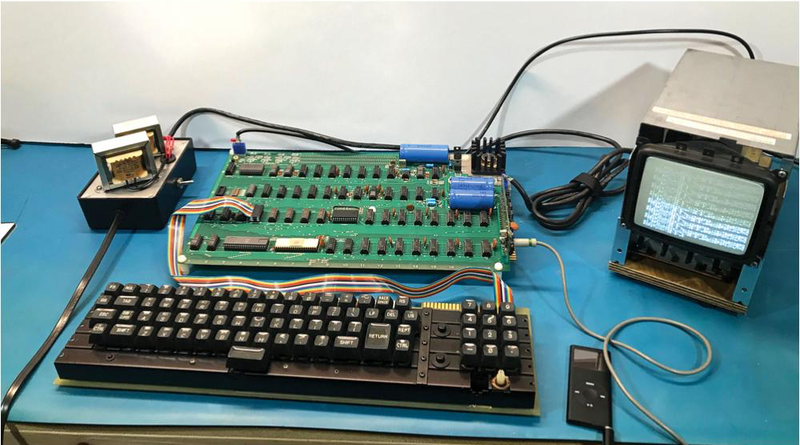 In person, it’s hard to grasp that the Apple I’s simple circuit board covered with neatly organized, hand-soldered chips played such a critical early step in the history of personal computing. More interesting to me than the auction though, is a video that the auction house put together to promote the sale, which dramatically pans around the Apple I’s surface revealing the smallest details. It’s a fantastic close-up of a significant piece of computing history that is far closer than you’ll ever be to one in a museum. You can learn more about the Apple I in this excellent feature by Communications and Information Technology Curator Kristen Gallerneaux on the Henry Ford Museum’s website.